My senior year, the Hinkley High School drama class put on a show of Picnic at Hanging Rock. I hung out with them, the usual assortment of misfits and oddballs, though I was never really a part of the drama clique. My closest association with the drama department was as the accompaniment for You’re A Good Man, Charlie Brown and a brief appearance as the black eyelinered Valet in No Exit. But there was one girl in the drama crew whom I gravitated towards: Neala. She was the embodiment of a free spirit: long red hair, a willowy build, a fiery temperament. She listened to Sarah McLachlan and had full-on Celtic pride completely unrelated to basketball. 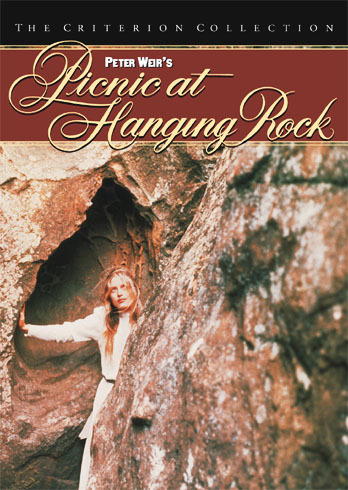 In Picnic at Hanging Rock, she played Sara, the young girl who falls to her death, possibly murdered by the headmistress. In the auditorium, the set builders went about constructing a mountain out of 2x4s, chicken wire, painted canvas and papier-mâché. They spray-painted the edifice gray, and it rose almost 10 feet into the air. When lit from above, the mountain cast huge, jagged shadows onto the stage, but from behind, you could see how it was a hollow shell, like a cream puff that’s been licked out. A rickety set of steps lead to the top, and it seemed stable enough, until you reached out steady yourself and found the rock crumbling in your hand. I had a crush on Neala, but whether or not my attraction Neala had a sexual component remains unclear, even to my 30-something gay self today. I want to say no, though I could just as easily say yes. High school was — perhaps still is — a haze of sexual confusion. I want to say that all my attraction to her was sun-dappled and full of warmth, but the more I examine it, the more I revisit it, the more it seems like a mystery that isn’t meant to be solved. I got in touch with Neala about two years ago, during one of those jags where I trawl the Internet in search of old friends, half-remembered names, fleeting acquaintances. I came across Neala’s mother, who then put me in touch with her. She finally wrote me an email under an assumed name, because she had been scrubbing her presence off the Internet because of a stalker. I replied, saying how good it was to get back in touch with her, that we should stay connected, that nobody should disappear into thin air. I’m waiting to hear back from her, and until I do, I will imagine her at the top of a hollow mountain, arms outstretched, as if to beckon me closer into the void, into the mystery.